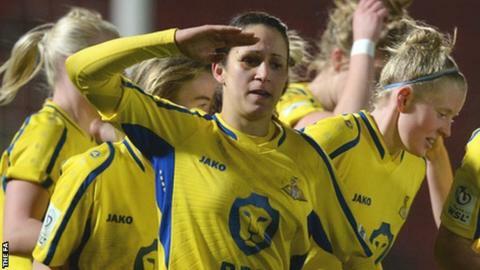 Doncaster Rovers Belles moved top of Women's Super League Two as a hat-trick from top scorer Courtney Sweetman-Kirk helped them win 5-2 at Oxford United. Yeovil Town remain third after Natasha Knapman's header saw them beat Millwall Lionesses 1-0, as a club-record crowd of 722 saw their first Huish Park game. Elsewhere, London Bees beat Aston Villa 2-1 to secure their second win of 2015. And Sarah Wilson's brace helped Durham FC come from behind to win 3-1 at bottom-of-the-league Watford. Second-placed Reading are now three points behind Doncaster with a game in hand, as their trip to Everton was postponed due to a large number of the Toffees squad being involved with the England Under-19s.